For a minute there, fans of Brooklyn Nine-Nine were shattered upon discovering that Fox had canceled the sitcom. The devastation echoed so deeply that it prompted NBC to pick up the show within 24 hours, and the first episode produced by the network was released last Thursday. Like the series, the real-world chronicle was both arrestingly dramatic and heartwarming. To feed your Nine-Nine mania, character designer Luigi Lucarelli has reimagined the main cast of the comedy as cartoon characters. 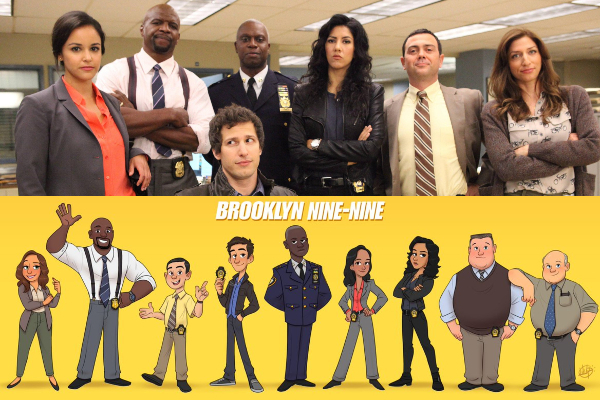 In his sketches, the artist captures the cheeky nature of ‘Jake Peralta’ (Andy Samberg), knowing smirk of ‘Amy Santiago’ (Melissa Fumero), ice-cold demeanor of ‘Rosa Diaz’ (Stephanie Beatriz), wide-eyed curiosity of ‘Charles Boyle’ (Joe Lo Truglio), deadpan glare of ‘Captain Ray Holt’ (Andre Braugher) and more to a T.
As ‘Jake’ would say, these character designs are, “Cool, cool, cool, no doubt, no doubt, no doubt, no doubt.” View them below and follow Lucarelli’s portfolio, Instagram, Tumblr, and Twitter to enjoy more of his work.